When it comes to getting your business online you could either DIY your own website or hire someone to do it for you. At theimagefile both of these options are on offer, but how do you figure out which method is best for you and your business? How much time can you dedicate to your website? This is the number one question to consider. How much time can you feasibly and honestly dedicate to building your own website. If you have a reasonable amount of free time then you might want to give the DIY method a go. On the other hand, if you have jobs coming in left, right and centre you might feel more comfortable handing the job over to someone else. Are you the type of person who wants to make all the changes and updates yourself, or would you rather focus on your speciality and outsource the rest? If you like to learn as you go then there are plenty of help articles and tutorials to talk you through the process. If you choose help or DIY, you can always make updates to existing pages and add new pages whenever you need. Are you still trying to figure everything out? If your business is fairly new or you haven’t finalised what you want your brand to convey, then I would recommend NOT hiring a designer. Basically, the benefit of having a website built for you is that you convey requirements and an overall style to a designer who then makes a website, quickly and efficiently, to your specifications. If you are unsure of what you want from the outset, your website build will just be hundreds of emails sent back and forth. Instead try to DIY something simple that will work for you now and then update and change aspects as you figure out your look. Once you have things settled in your mind a designer is always happy to step in and add those finishes that you may not be confident doing yourself. Does techy stuff terrify you? Building a website is fairly simple really but it does require some time and effort to get the look you want. If you follow the step-by-step guides and online tutorials we provide you should be fine. However if the idea of techy stuff makes you feel nauseous you can hire a web designer that will do it all for you. This is meant in the nicest way, but if you already know exactly what you want and don’t want any variation from your original idea then it might be better if you DIY your website so you have total control on how everything looks. There’s nothing more time consuming for both you and a designer than spending weeks trying to find that exact shade of blue. If you are interested in hiring a designer to build a website for you, check out our website design service! Which method is best for you? 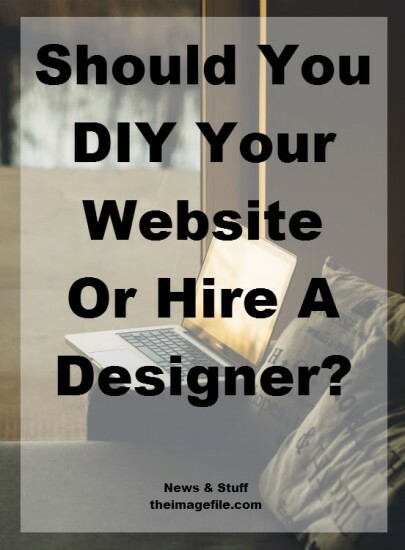 Do you think it’s better to DIY your website or hire a web designer?